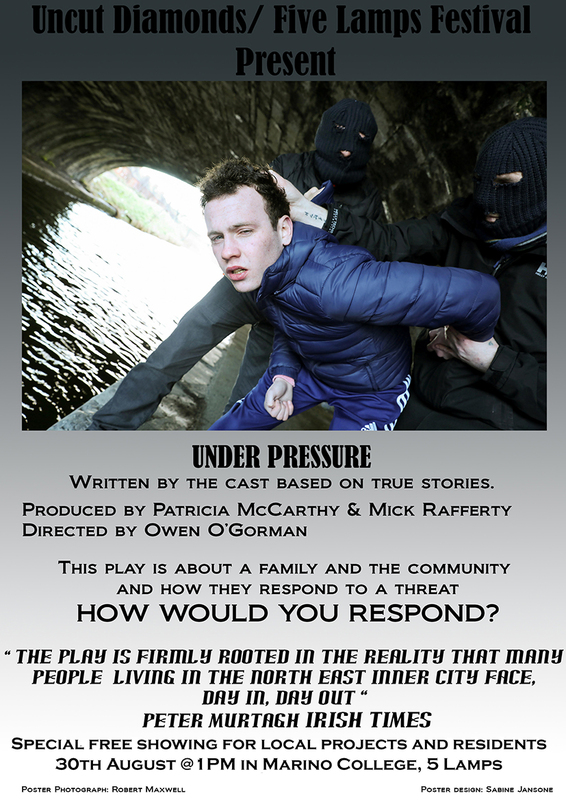 Under Pressure – a play about a family, the community and how they respond to a threat. As part of the Five Lamps Festival there will be a special free showing for local projects & residents on the 30th August, 2017 at 1pm in Marino College, The Five Lamps. In the mind of their creator, Gus and Molly live in Ballybough, the north-eastern edge of Dublin’s north-east inner city. The dramatic play is set in the crowded north east corner of Dublin’s inner city, where, in some situations, residents are left to fend for themselves. It deals with contemporary issues of community intimidation and how this brave family and their strong community respond. The play, which was a part of last year’s magnificent Five Lamps festival in the Sean O’Casey Theatre, has been well received by the Irish Times, Online. For some, the reality of this dramatic and contemporary play might be a little too close to home. But, it is in that reality that this community lives. Uncut diamonds have put together a great piece of work that highlights a social issue suffered by many, all too quietly. So, be sure to save the date, spread the word and make time to see this play. As part of the Five Lamps Festival there will be a special free showing of Under Pressure for local projects & residents on the 30th August, 2017 at 1pm in Marino College, The Five Lamps. Author HOPE Hands On Peer EducationPosted on August 30, 2017 August 31, 2017 Categories Community EventsTags 2017, 5 Lamps Festival, Community Theatre, community theatre group, Dublin, Dublin North East Inner City, Five Lamps Festival, Free Showing for Local Projects & Residents, Marino College, Mick Rafferty, North Inner City, Owen O'Gorman, Patricia McCarthy, Play, Uncut Diamonds, Under PressureLeave a comment on Under Pressure – a play about a family, the community and how they respond to a threat.